Rotary File for Aug 4, 2015 | Rotary Club of Iowa City A.M. The August 4 meeting featured young people from City and West High Schools who attended RYLA or the World Affairs Seminar in July. Our sympathies go out to Valerie Martin who lost her mother to cancer this past week. Myrene Hoover announced that 15 of our members, or 23% of club members, participate in 30 different District 6000 committees. Jim Peterson imparted the secret to getting selected for a district committee: just volunteer! See Mark Patton for IC Noon Club 100th Anniversary raffle tickets at 1 for $25 and 5 for $100. Call Paul Nichols of the Downtown Club at 319-383-8981 to sign up for a slot to donate blood 4-7 on August 6 at the Iowa City Public Library. Tom Novak was spotted on an ad for the Mercy Care System. At least 18 Rotarians gave updates and contributed a buck or more. Linda Farkas from IC Noon Rotary introduced the high school students who attended RYLA and the World Affairs Seminar over the summer. Linda worked closely with Nancy Pacha and Nan Johnson in the selection process for these students. 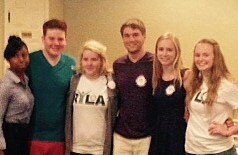 The RYLA students attended the intensive leadership training on the campus of Grinnell College July 26 - 31. None knew exactly what they were in for at the start and some were quite skeptical. They were quickly immersed in activities designed to break down their individual shells and get each team member to open up to others in their groups because this was a safe environment for sharing. All of the students came back with life-altering experiences that will serve them well long into the future. The World Affairs attendees traveled to Carroll College outside of Milwaukee to participate in a seminar called "Global Energy: Who has the Power?" Much like the RYLA experience, the World Affairs attendees gained confidence in their critical thinking, speaking and sharing abilities, and they made lasting friendships. One difference between RYLA and World Affairs is that there were attendees from many countries around the world for the World Affairs seminar. The students met other participants from as far away as Nepal during the seminar. They heard world-class authorities on aspects of global energy and were able to critique the speaker's presentations in their small groups. At the end of the week the student groups made their own presentations to all attendees. It was very apparent that all of the attendees grew from their experiences and that the dollars AM Rotary put toward sponsorship of these young people was well spent. Support of these two youth programs is funded each year directly from the sale of nut products in the fall.